Love this nightstand! The craftsmanship is very good quality. The colors in the wood are beautiful and make it easy to work with just about and decor. The only thing you need to do is put the handle on the drawers; it is fully assembled. Looking forward to the rest of the bedroom set to be delivered. Accent your bedroom decor with the natural beauty and practical design of this multi-colored nightstand. Made from Asian hardwood and tropical wood, this double-drawer nightstand features simple yet timeless black metal hardware and a felt-lined drawer with wire management. This product will ship to you in 1 box. Dimensions 26.0 In. X 16.0 In. X 28.25 In. Beautiful nightstand, well-made and sturdy. The colors are exact, and the drawers have a huge amount of storage. Love this product line. It is exactly as pictured and is great quality. Came quickly and was well packaged and fully assembled. 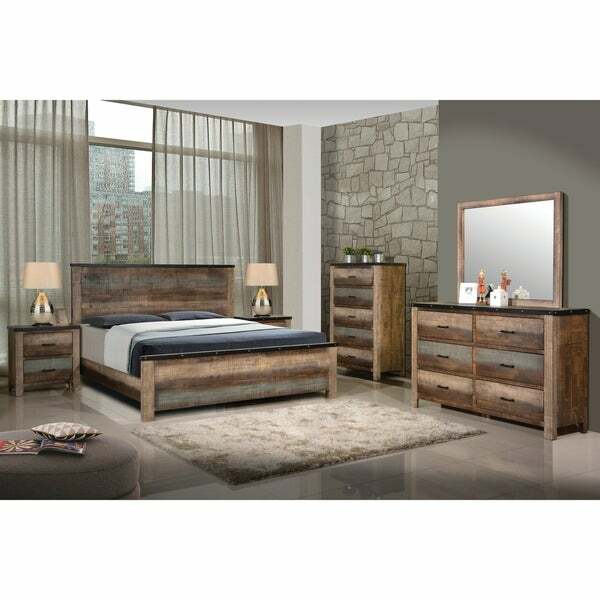 I would recommend this to anyone wanting a modern yet rustic touch. Beautiful night stand. Came heavily packed to prevent any damage what so ever. Fully assembled. Drawers slide nicely. They paid attention to every detail from the metal details to the dove tail drawers!!! I can't wait to get the rest of my bedroom. Purchased this to go with my existing Carbon Loft bedroom set. I was worried that it may not match because I bought the set last year. it's perfect and completes the set beautifully! Great price and good quality!! This is the first time I have ordered furniture from an online retailer sight unseen. I was quite impressed with the quality....is it perfect, no, but it is very sturdy, looks exactly as pictured and for what I paid, I have no complaints. It comes completely assembled, you just have to attach the handles. I am definitely happy with my purchase. This set is very well made. It has dovetail construction. A very heavy piece. Can't wait for the rest of my pieces to come!!! My children are fighting over who gets the new set!!! Interesting finish, exactly what I was looking for. A slightly "industrial" look. I ordered the whole set, the bed and dressers and other night stand were very late in being delivered, but finally arrived. One thing that is uniformly wrong is that the holes for the handles that you need to install are drilled at a slight angle which makes them not line up, so a little redrilling will be necessary.